That is 3:43 a.m. I am not up because I cannot sleep, although that has happened. I'm up because I have to leave my house and get on the road to head east to the Indiana job. They needed someone on-site and no one else could do it. I was amazed at the ease of getting up at 3:15 when the radio went off. Mija was purring up a storm as she lay next to me. I threw off the covers, swung the feet to the ground and heard the patter of raindrops on the window sills. Oh joy. A quick shower, a quick collection of the things I needed to take with me and I'm out the door. It wasn't until I hit Indiana that I realized I'd forgotten the pastries purchased from Panera the day before. They were still in their bag on the counter where I saw them but the brain didn't register they needed to go along. I had milk and Prednisone but I shouldn't take that on an empty stomach. 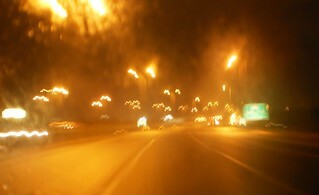 Well, nothing is normal when you're up and on the road at 3:43 a.m. The Interstate was nearly deserted. It's got a surreal beauty at that time of day and particularly when it's raining. It was actually a steady drizzle but it still made the street and car lights reflect off the pavement. I really wanted a sunrise, but with the heavy overcast and drizzle, I got more of a lightening of the clouds. It was morning before I realized it was morning. Again, something about the brain on auto-pilot, knowing exactly where it's going since we've done this before, and suddenly realizing it's light out and has been for probably 45 minutes. I got to the job site in record time and no, I did not speed. Westbound on I-80 was a mass of trucks. That must be peak travel time so deliveries are made around 7-8 a.m.My dad did that, the last years of his life, drove a semi truck. I don't envy them other than they do go all over the US. That's what dad loved, the travel to places he'd only heard about. The drive in drizzle around the south end of Lake Michigan is terrible and there's always road construction, always. 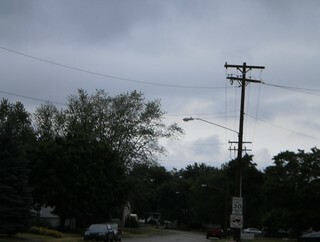 The morning in Indiana was overcast and drizzly. It wasn't going to let up any time soon, either, since I'd driven ahead of the rain. The temperatures weren't uncomfortable and I could park my car to see the job site and do my job from the relative comfort of the Jeep. After a full morning, I was let go to head back to Chicago. I drove into the drizzle which had followed me here. 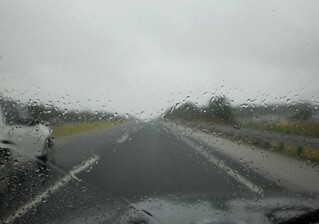 A stop for lunch and back on the road, driving out of the drizzle near Hammond. I was tired, but nothing hurt. A year ago, I couldn't have done this without major discomfort. I would not have been able to stand for the 4 hours I was on the job site. I brought along a lawn chair to sit down if I'd been asked to be on the site. I could sit by my equipment after a bit of standing. Thankfully, I could sit in the car which did lend itself to nodding off occasionally. So June has started with greatly needed rain and a trip eastward. When I was younger, I used to do these kinds of jobs, a lot. I pulled some overnighters and worked an 82 hour week. I could do it now, if I had to but it comes with a price. The past weekend was a bit of a blur as my body readjusted to regular awake time. I got home from Friday's trip and fell asleep in the recliner. Oh, and I ate those two rolls I was going to have for breakfast.